Home Misc Legendary Productivity Tips & Advice: Toss them? This article, Toss Productivity Out, threw me. 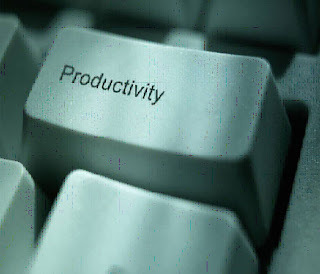 Leo Babauta, the writer, created the immensely popular productivity blog zenhabits.net. I’ve learned a lot from him over the years, and from other writers of productivity advice. I subscribe to literally dozens of productivity blogs and it’s very unproductive….who has time to read them all? But many of their ideas and tips have become a part of my life. Now Leo is saying “Toss productivity advice out the window”. Whoa. Did I already say “Whoa”? Not only have a lot of these tips become a part of my life, they’ve changed the way I do everything from handling work projects to cleaning out my closet. They haven’t made me perfect (hahaha!) but they’ve definitely helped me to develop a structural framework to use as a starting point. I’m pretty sure I’d be lost without them. Can I toss them? Really? Whoa. (that’s the last time I’ll say it, I promise….not trying to get good SEO results on the word “whoa” today). 1. Get Organized. Leo suggests that getting organized is often little more than rearranging the deck chairs on the Titanic. He’s changing his stance to suggest we simplify. Rather than organize a zillion things, SIMPLIFY so there’s no need to spend valuable time organizing. Decide what’s important and get rid of the rest. Not just talking about “stuff” here, but the tasks that clutter our lives as well. I’m actually fairly good at this (on the tasks, not the stuff) and know that I need to be more so. Taken to heart, Leo. This clicked with me and I’m down with it. 2. Keep an Idea List. Popular advice for capturing our best ideas is keeping a notepad or equivalent handy to jot down ideas as they come. Leo is calling BS on this. He has come to the conclusion that the idea list never has the best ideas. Our brilliant ideas get acted upon immediately. We get excited and dive in and do them. I’ve tried different variations of the “idea list”. A small notebook in the car seat beside me, my iPhone notepad, Wunderlist, and even a tape recorder. Again, I have to look at all he has to say about this and agree. I’ve never done anything with any of the stuff on those lists. 3. Set a Lot of Goals. This will be the hardest one for me. I mean….I’m a member of the Franklin Covey cult. I have Ben Franklin’s list of virtues taped to my computer so that I see it every day (his little book was the basis of the Franklin Covey Planner). I am a CERTIFIED FRANKLIN COVEY FACILITATOR, for heaven’s sake!!! I am SUPPOSED to have a detailed list of my entire life plan, with the goals broken down into steps, and every day working towards completion of the goal in a 10 year plan. OK, so I don’t do this, but I’m SUPPOSED to. But Leo says that simplifying his goal list got him better results, and paring it down to ONE goal a year was even more effective. Now he does no goals. He’s focused on what inspires him NOW. Good golly. I don’t know, Leo. You’re pushing up against my boundaries on this one! He does suggest that we wean ourselves down slowly. Maybe starting with focusing on 3 goals, or 1. All I can say is “I’ll try”. And don’t quote Yoda on me. This is asking a lot. 4. Track Everything. Woot! I’ve got the elimination of this task mastered. There was a time in my life (Franklin Covey Planner, remember) when every moment of every day was tracked. My kids will have a brilliant (and boring) diary of my life (that they’ll never look at) if they want it. I was recently able to pinpoint the exact date that I quit smoking in 2005 by pulling out my Covey Planner from that year. I mean, really??? Who does that? Leo is saying that we need to be IN the moment instead of TRACKING the moment. I’m on board with that. Totally. 5. Be Productive When You’re Waiting. What he’s referring to here is the concept of always having stuff you can be doing at hand. If you’re stuck in traffic, listen to an audiobook. If you’re stuck in a doctor’s office, bring your laptop and work. Checkout line? Clean up your email or text list on your phone. GUILTY! I’m a busy single mom. I really do have to try to make the most of every minute when I can. And well, I’m mentally bored if I’m just gazing out a window. But he makes some good points. I’m aware that I miss a lot of what’s going on around me. I’ll experiment with this. Maybe today I’ll just go out to my mostly unused brick patio, WITHOUT A BOOK, and just sit and look around me. 6. Keep Detailed, Context To-Do Lists. Sigh. Leo, if I stop doing this, I’ll be so disorganized. I have simplified a LOT though. I’m not using a Covey planner anymore (I’m sorry Dr. Covey….I still love you!). Leo now does 1-2 things per day, and all the rest he gets done is gravy. 7. Work Hard in Bursts, with Frequent Breaks. OK now I’m blushing. I tried this last weekend. I’m working on a huge project, and I determined to set a timer to work on it for 45 minutes, then work on housework for 15, for the entire day. Please read the entire article http://zenhabits.net/un/. He goes into greater detail than I did. He and a zillion other productivity gurus have changed my life over the years. I have a feeling his new insight will continue to do so. Next articleTime Travel: A lady’s treasures…. Vote for Dropbox in the Crunchies 2010!